The sky was beautiful in Houston last Sunday and the early summer heat and humidity not overly oppressive. 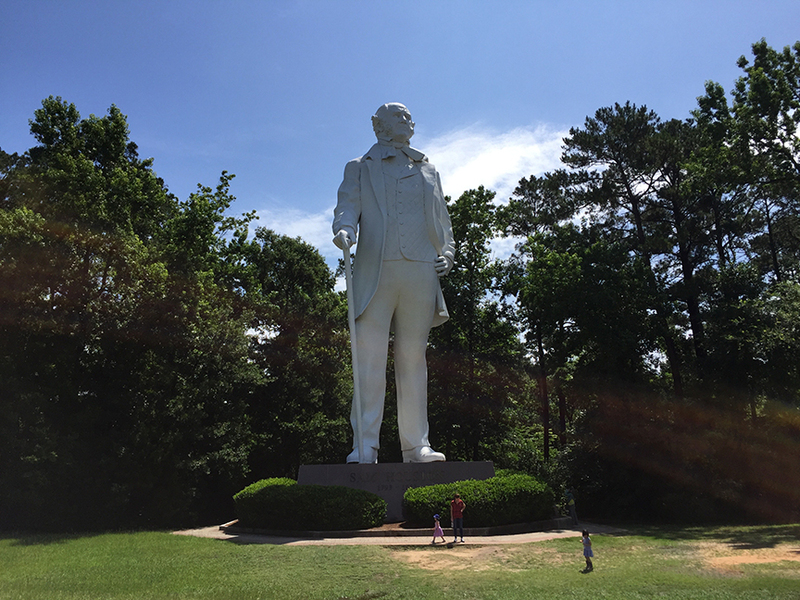 And so the Parzen family decided to take an hour-long drive from our home in the southwest of our beloved megalopolis up Interstate 45 to Huntsville to visit the 67-foot-tall statue of Sam Houston. The weather was so nice that a walk in the woods seemed like a great idea. And anticipation of a two-patty cheeseburger at a friend’s food truck in nearby Magnolia only sweetened the recipe for a great Sunday morning spent with my wife and two daughters, ages three and five, in the Texas sunshine. It had been one of those great mornings that families cherish until we walked out of the lovely visitors center there to discover the truck above, parked conspicuously and unavoidably right across the small lot from our Honda Odyssey mini-van. Our daughters don’t know yet what a Confederate flag is or how it represents a legacy of hatred and racism borne out — falsely, blasphemously, and slanderously — in the name of Jesus Christ. And what about the sweet, gentle young African men, also visiting the statue? 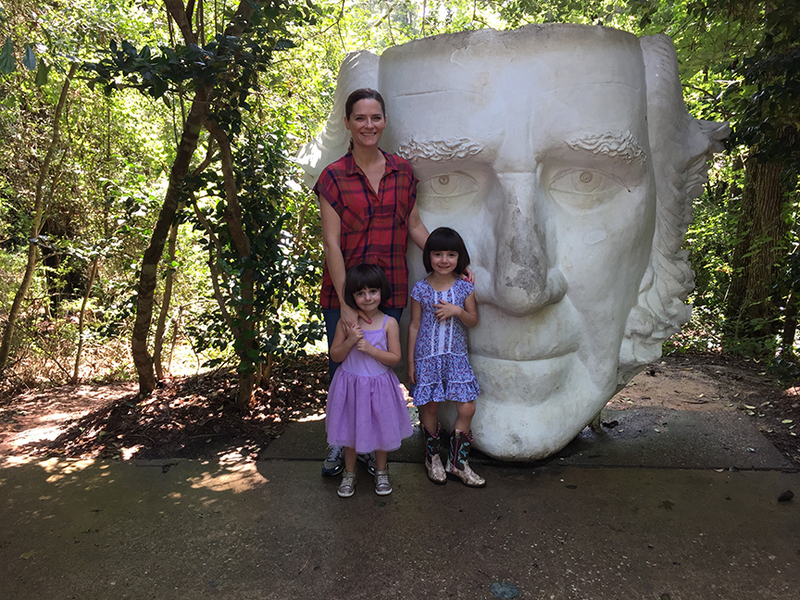 They had handed us one of their phones and asked us to take a photo of them, arm in arm, standing beside the gigantic Sam Houston head below. Their broken English betrayed their newness to our country. 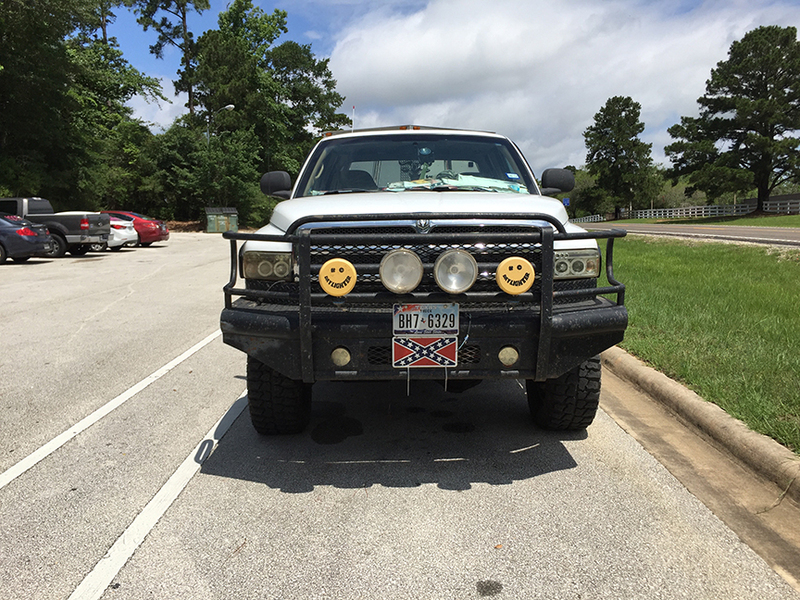 I could only wonder whether or not they know what that flag means and why someone would affix it to her/his truck as an expression of personal ethos. As the father of children who share my Semitic heritage and a free citizen of the United States of America, I am compelled to speak out against such despicable and rancid displays of so-called white supremacy in public view. And I will not stand for or beside those who claim that the flag is an innocuous anachronism embraced by re-enactors and celebrants of southern American culture and history. It’s not. It’s a symbol of institutionalized hatred and intolerance — plain and simple. And people who display it publicly do so to instill fear in those who don’t share their own heritage and color. No, I’m not afraid of Muslims who live in my country or terrorism in Trump America. I’m not afraid of brown people taking way jobs from me or my children. I’m not afraid of black people who live, work, and raise their families side-by-side my wife and me in Texas. No, none of those things scare me. It’s the white people in Trump America who scare me. The white people who propagate hatred, however subtly or bluntly, through their embrace of hateful icons. And I’m even more scared by the white people who don’t speak out and stand against their misguided sisters and brothers. ← Waiter, waiter: please don’t put the cork on my table! Well said…!! and Thank you…. I left your blog a few years ago when you began to spend more time praising Obamacare and gushing about your new daughter than talking about wine. I thought I would try it again today and was disappointed to see your gross generalization of Trump supporters as white supremacists. I really enjoyed your wine blogging and thoughts on other aspects of culture. I find your need to proselytize your politics off putting..